The day that we had all been waiting for so excitedly for over six months had finally arrived! The sunrise on the first morning down at Marazion was beautiful and set against the backdrop of St. Michael’s Mount, myself and around forty other cyclists set off on the opening miles of our big adventure that would take us all the way to Plymouth just on the opening day. 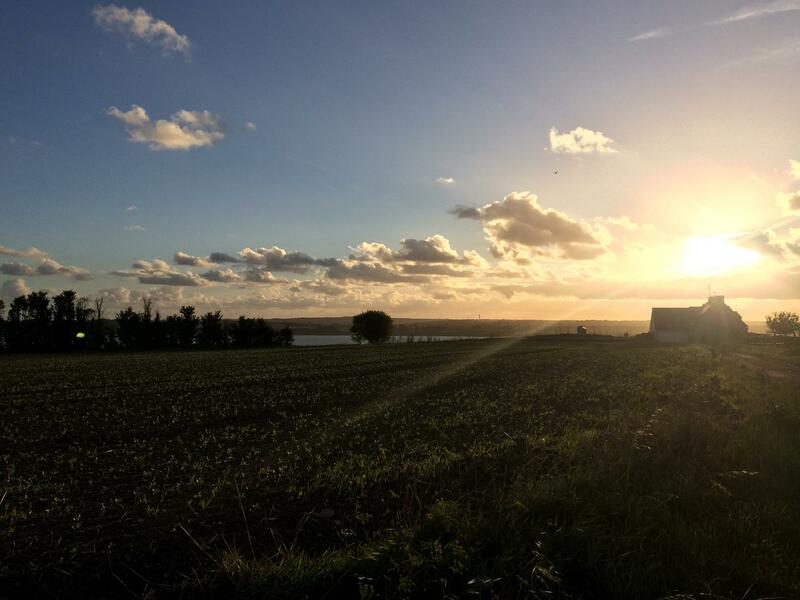 Seventy-five miles of the beautiful Cornish countryside would undoubtedly be challenging but the thought of exactly why we were undertaking this journey would be there in the back of our minds to spur us on and help to will us up the winding and meandering hills. We were blessed with exceptionally good weather. The bright sunny spells, gentle breeze and generous temperatures of around 15 degrees formed perfect cycling conditions. In just the first hour, and all the way to the first water stop and Bissoe, I spoke to several people and could feel new friendships beginning to develop. I knew that the next four days would remain with me for the rest of my life. I was thoroughly enjoying my first day’s cycling and everywhere I looked there were smiling faces, lots of laughter and the odd light-hearted joke amongst the group. 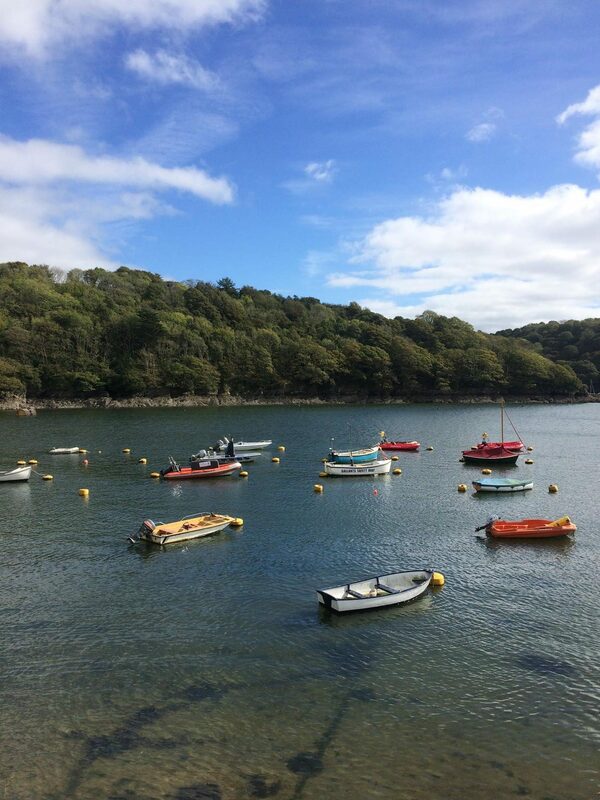 I felt relaxed almost immediately and following on from our first stop, we stopped for a very impressive lunch at the Galant’s Sailing Club in Fowey. We stayed here a while after enjoying a meal of pasta and vegetables. The view across the river from the restaurant was the perfect tonic after a good 47 miles of cycling. We boarded the ferry a couple of hours later and made the relatively short crossing. There was only around twenty-five miles left until Plymouth and after making a final stop for water and refreshments, the group set off on the final leg. One thing that really hit home was just how we had all come so many miles but all had such enjoyment along the way. One of the perks of group cycling is that the miles seem to do themselves and the time just flies by! I enjoyed many conversations and before we knew it, we were at Plymouth. The first day’s cycling was complete! We had a few hours to kill before the overnight ferry crossing to Roscoff and so it was time to sit down to a nice meal and a celebratory drink with friends. We awoke from our ferry cabins early on Thursday morning. We were in France! The weather was a little damp but it didn’t dampen anyone’s spirits. There was another 70 miles of cycling to be had! Just as long as we remembered to cycle on the right hand side from now on. 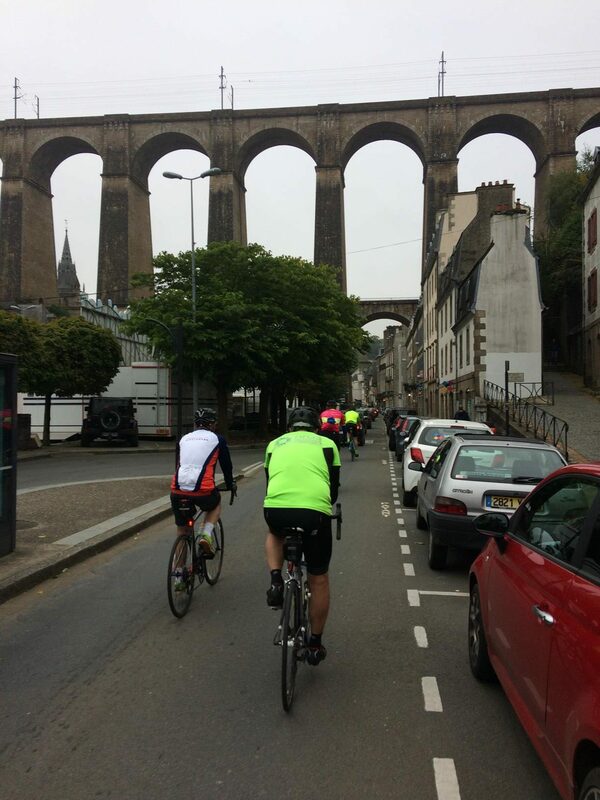 The road from Roscoff was mainly flat for the first twenty miles and before we knew it, the first water stop was just ahead of us. 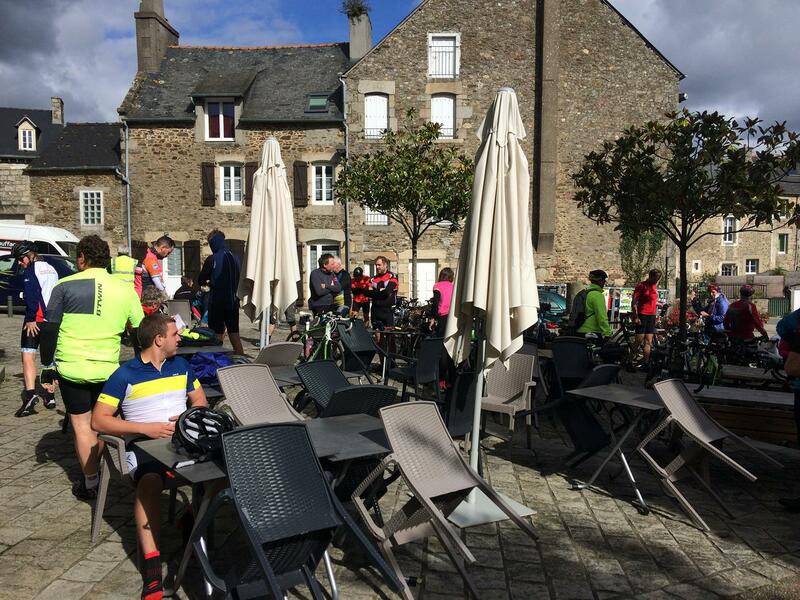 We stopped at a small café just outside Morlaix for a quick refill of water and coffee. Before reaching our first stop, we were treated to a magnificent section of very smooth and sweeping downhill bends which were nestled between a beautiful forest. The autumn colours of ambers, reds and browns were on show all around us and I realised just how much I was enjoying being part of such a wonderful team of people. The weather was forecast to be rainy in the afternoon and we set off again with some light drizzle. 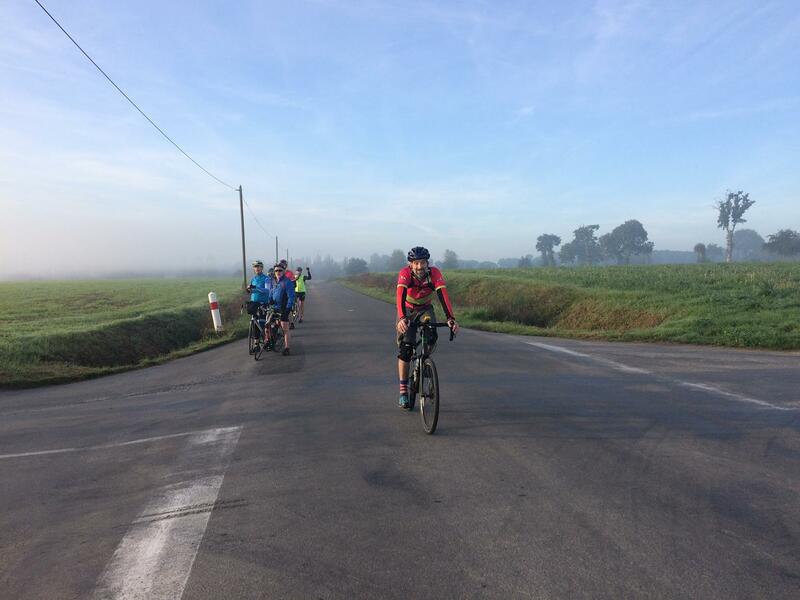 Luckily, the terrain was relatively flat – save for some moderate hill climbs. In what seemed like no time, we had arrived at our lunch stop! During the next hour, the rain that was promised did materialize. That wasn’t a problem though as we all had our wet weather gear to the ready! The rain subsided just in time for our final drinks stop and we found ourselves in a small village where we found a rather fantastic church spire right opposite us. 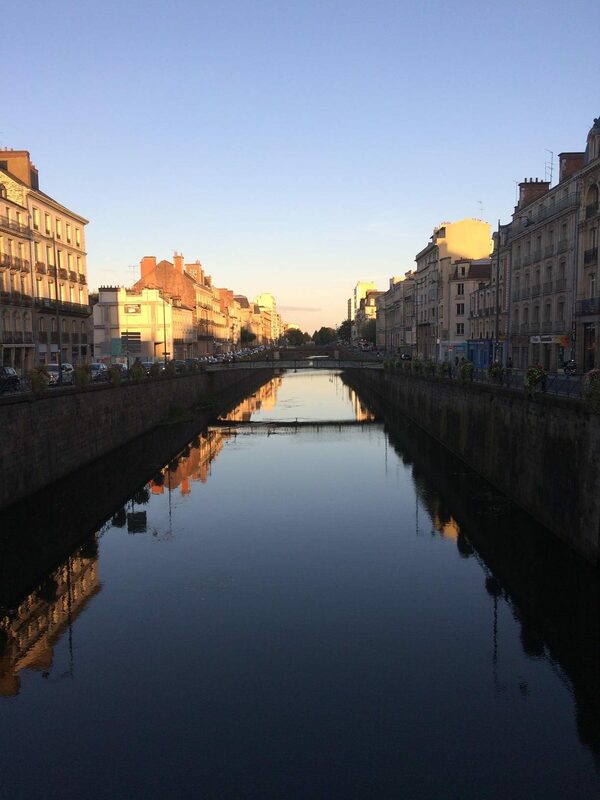 The general consensus was to finish off the remaining miles and get to our hotel in St. Brieuc. We were all a bit damp from the weather but there were still plenty of smiles to be had all round. It was really surreal to think that we had now covered half the distance! 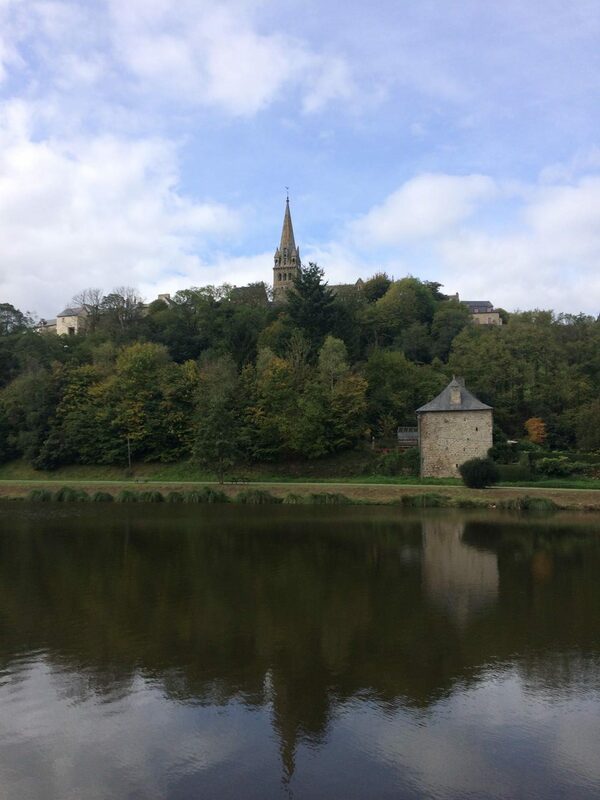 We passed through the town of Guingamp and we were only twenty miles away from the hotel. I was looking forward to a little bit of relaxation and a sit down to something tasty for our evening meal. We were all really enjoying cycling in France. The roads were predominantly, very smooth for most of the time and there was no sign of any monster hills! I cycled in with a small group of around four other riders and we made it to the hotel. I wanted to get out of my damp clothes and enjoy a nice warm shower. We awoke on day three to bright sunny conditions. The sky was a beautiful colour blue and the temperature was mild – especially for this time of year. I had been very much looking forward to this day. 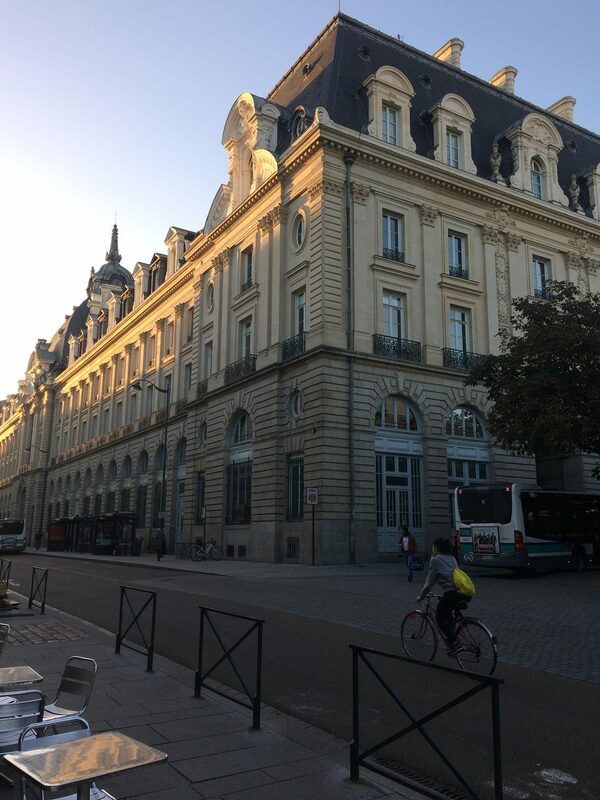 We were due to finish in the historic city of Rennes and it was time for me to use the helmet camera for the first time. We started the day off with a few hills but the group were moving well and everyone was in good spirits once more. We stopped at a fantastic little bakery in a place named ‘Lamballe’. I perused the sugary treats on offer and decided to buy a ‘Beignet’. I can only describe this as a very large jam doughnut and it tasted as good as it looked. 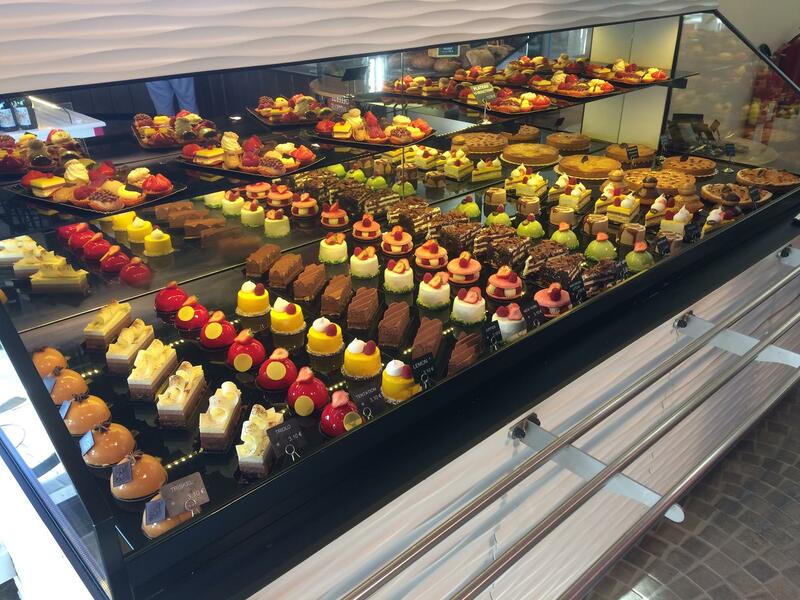 All around, there were cakes, pastries and all sorts of sweet treats – too many to take in! I sat down with a cup of tea and talked to some of my fellow riders about how lovely the weather was today. After reluctantly leaving the bakery behind us, it was time to press on towards our lunch stop. The next hour or so was mainly spent in complete awe of the beautiful French countryside. The open corn fields were littered as far as the eye could see and it made for some great footage on my helmet camera. 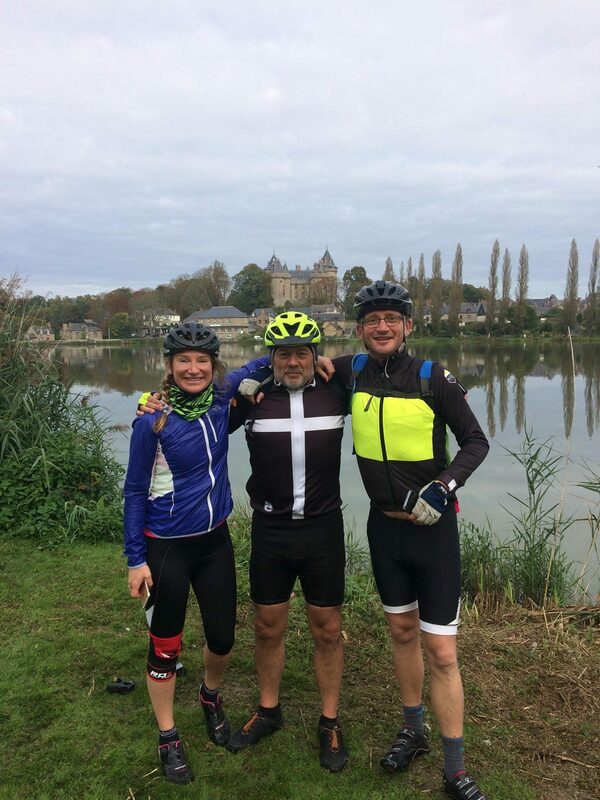 I rode with Bryony, Oliver and Richard through the ‘Foret de La Hundaudaye’. A single road snaked through this forested area and at one point, the road was so straight, I could have sworn I could see almost half a mile ahead of us. We continued on into the beautiful area of Pleven. There was a church spire looming in the distance and as we got closer, I slowed down for a closer look – and of course – some pictures! A common theme started to develop as we passed through several small villages. Most of which had their own church and I couldn’t help but stop for a photograph in each of them. 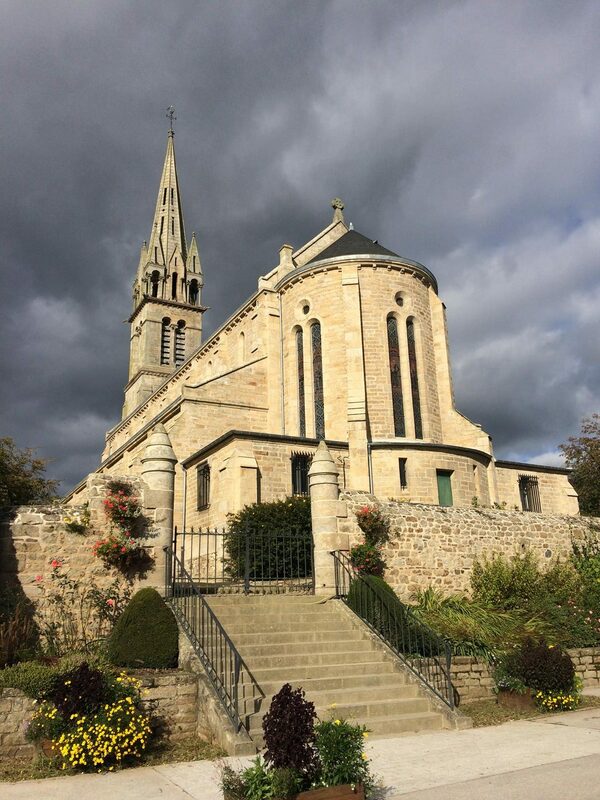 After a hearty lunch at ‘La Grange’ in Corseul, it was time to head towards Rennes. I’d mentioned there was a steep hill in this area and after tackling it with the same group of riders, we stopped at the very top to wait for everyone to make it to the top. Our fantastic tour guides had once again come up trumps with our water stop. We stopped off at a beautiful and picturesque lake in a place called ‘Miniac-sous-Becherel’. There was another church spire in the background and I stopped here for a while to collect some acorns to take home as souvenirs. The road to Rennes was up next and I couldn’t believe at just how much fun we were all having and just how fast the time had ebbed away. I didn’t want our trip to end. However, deep down, I could feel my legs starting to just feel the first signs of fatigue and I had to think about my pacing. After travelling through ‘Plorec-sur-Arguenon’ and photographing yet another church, I spotted the very first mention of Rennes on a large sign just adjacent to the road. I was excited about cycling into the big city! As we made our approach, the areas around us became more built up and populated. A big thank you to all the French drivers who treated our group with patience and respect. 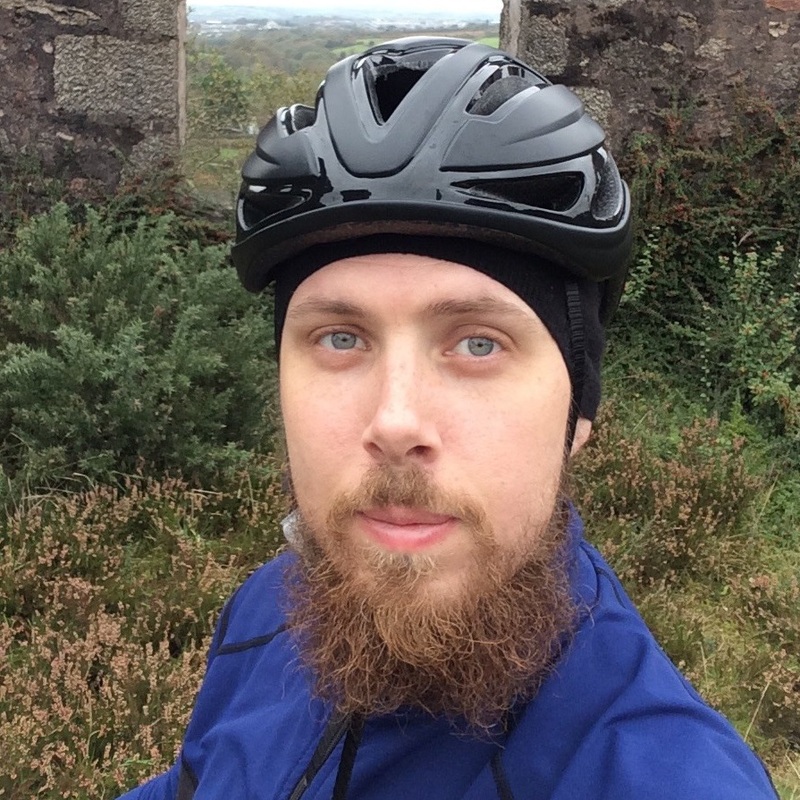 I was really very impressed about the amount of room and time we were given over here and it’s a really positive thing which made me feel absolutely at ease with cycling into the city centre. Our hotel was comfortable and stylish. The location was just outside the old town and so I made my way over with Pete for some photographs. After an hour of walking and photographing the beautiful architecture and canal, it was time to head back for our evening meal. There was much excitement within the group as tomorrow we would be reaching our final destination of Mont Saint Michel! After another nice meal, I set off to bed at around 10:30 pm and slept soundly through to the following morning. The big day was finally here! We only had fifty miles of flat road ahead of us and everyone was still together as one big group. That was the beauty of this trip. Everyone supported everyone for each and every mile. Together we were about to achieve something truly special. We rode off into a beautiful sunrise. There was a chill in the air but the further the sun rose, the warmer it became. There were plenty of peaceful roads and the rays of sun shining through the early morning mist bought about a magical experience. 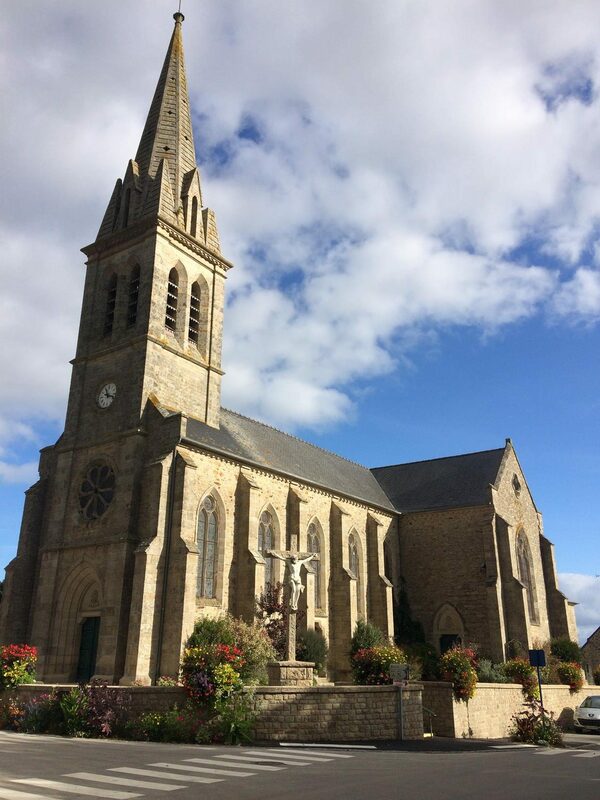 It wasn’t long after setting off and we were stopping in a place named ‘Aubigne’ for our first water stop. I had a small coffee and relaxed for a few minutes whilst chatting away to the group of riders that I had spent the morning with. We set off in the same group and continued through the beautiful countryside. There was little in the shape of hills today and that put a smile on everyone’s faces! Little did we know the treasure that was just up ahead. 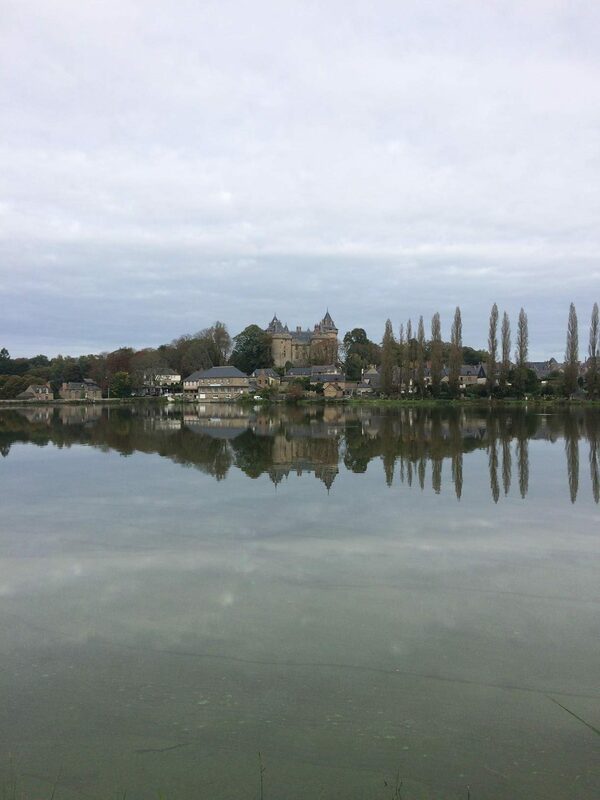 In the aptly named ‘Lac Tranquille’, a vast lake was set against the backdrop of a beautiful French chateau. It resembled something like a Disney princess castle and I couldn’t help but think how much my young daughter, Molly, would love to see it. It made for the perfect photograph and I set off with Mitch, Dani and Pete towards our lunch stop. The roads continued their flat trend and we were treated to yet more quaint towns and villages along the way. I was looking forward to something to eat and just as I was starting to get hungry, we had made it to our final lunch stop of the trip at ‘Pleine-Fougeres’. The plan was to all set off in the same group towards Mont Saint Michel as we had little over eight miles until arriving at the Mont! There was a buzz amongst everyone as we all knew the hard work had been done. In less than half an hour, I saw the Mont for the first time. Looming up on the horizon and starting to edge closer and closer into our view. We cycled in convoy along the boardwalk and across the line! We had made it to Mont Saint Michel! We enjoyed a small cup of champagne and a team photograph. We were all free to celebrate the moment. What an achievement for us all! All the months of hard work in terms of training and fundraising, we had arrived at our final destination! Many hugs and handshakes later, we set off back towards our hotel to get ready for our celebratory meal.